This evening, after the museum had closed and all the galleries were quiet, I installed the second temporary artwork onto the donation cases in the Tunnel and Grand Entrance of the V&A. The experience of walking through the emptiness of a building usually so busy with visitors was quite magical, and the silence gave the museum a hallowed sense of a sacred place. Research suggests that the colour red has a physiological effect on the human body, increasing our heart rate and raising testosterone levels in men. These effects can make us spend more money. Hey Big (Red) Spender! will try to determine the success of this concept when applied to museum donation cases. 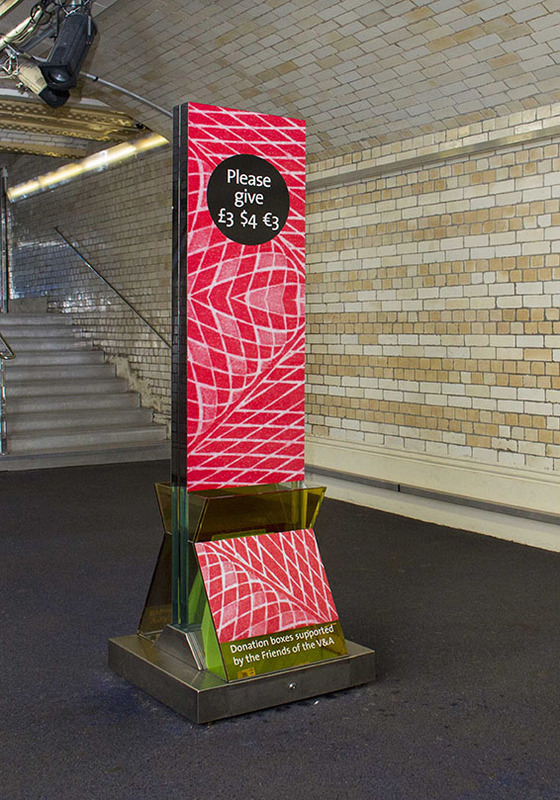 The third and final artwork, called Growing Donations, will be on show during the V&A’s Digital Design Weekend, on the 20th and 21st of September 2014, and will explore the idea that the presence of flowers inclines people to be more generous.